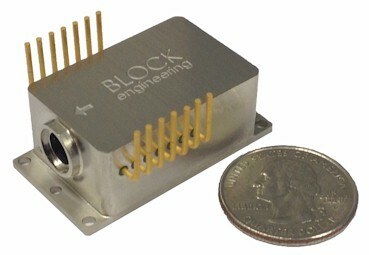 The Mini-QCL module is a miniaturized version of Block's LaserTune tunable QCL source, designed for OEM applications. Measuring approximately 1 cubic inch in size, each Mini-QCL module offers a 250 cm-1 tuning range. Modules are available within the same industry-leading tuning range as the full LaserTune instrument of 5.4 - 12.8 microns. Multiple modules can be controlled by Block's dedicated miniature driver electronics and can be seamlessly integrated together by either the OEM or by Block, depending on the requirements of the application. The interface to the electronics ranges from low level serial up to high level Ethernet protocols, enabling a variety of levels of integration by the OEM. The Mini-QCL module can be used in a wide variety of real-time gas analysis applications requiring a mid-infrared laser source, including greenhouse gas monitoring, automotive combustion analysis, oil and gas exploration, and air quality monitoring. Since the laser is eye-safe, the Mini-QCL offers significant safety advantages over other laser technologies in industrial settings. The module is also designed to be integrated into a variety of spectroscopic instruments, including products used in the fields of Photoacoustic Spectroscopy (PAS), Cavity Ring-Down Spectroscopy (CRDS), and Atomic Force Microscopy (AFM). The Mini-QCL can be integrated into IR microscopes and unique IR spectrometers that can conduct standoff, non-contact detection due to the high spectral radiance of Block's QCLs. Download a detailed specifications sheet for the Mini-QCL (PDF). If you would like to discuss how the Mini-QCL can help with your application needs, please contact us.